Have you ever wanted to enhance your photography and design work, or even to create incredible images to sell? 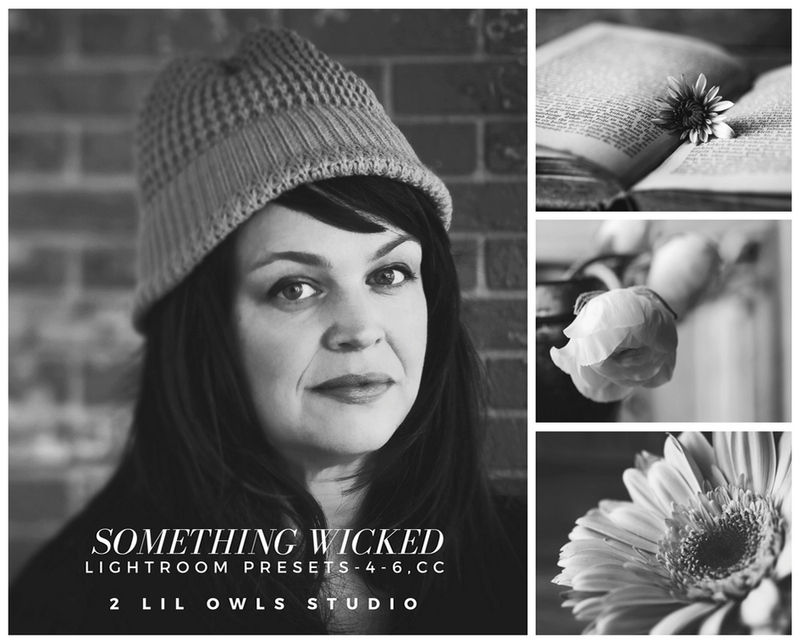 Let world renowned texture artist Denise Love from 2 Lil Owls Studio show you how! We’re so excited to bring you The Ultimate Texture and Photography Kit, giving you everything you need to create beautiful photographs and digital texture art from scratch. Learn professional lighting and studio techniques as part of a 14 part video course, and watch as Denise walks you through how to apply textures, customise your images, and create stunning compositions from scratch. This complete texture education is backed up with 360 all new fine art textures, Lightroom presets and tons of creative goodies which you can work with whilst you learn. 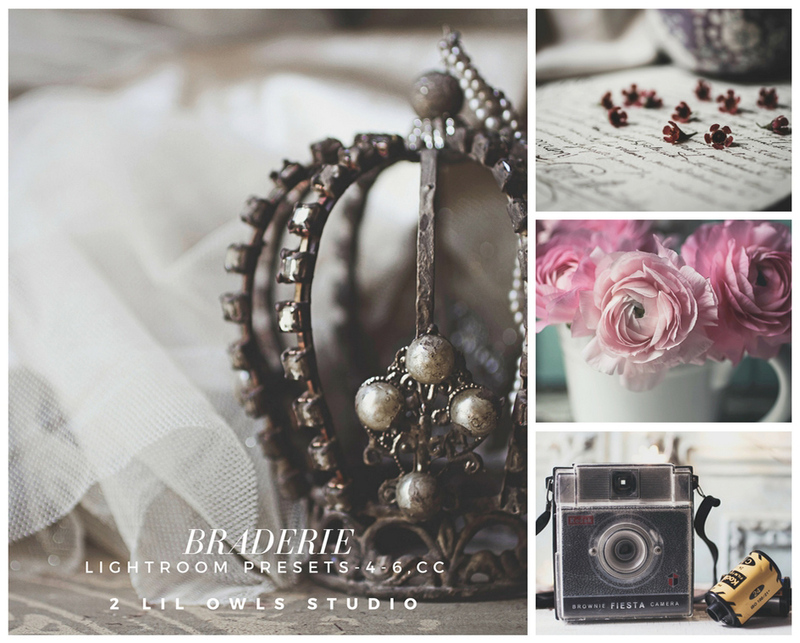 4 Professional Lightroom Preset Collections: These ready-to-use Lightroom presets let you transform your photography work in seconds, using Denise’s favourite tried and tested settings. 3 High-Res Brush Sets: These hand-made whimsical brush sets are perfect for adding lovely details to your work. 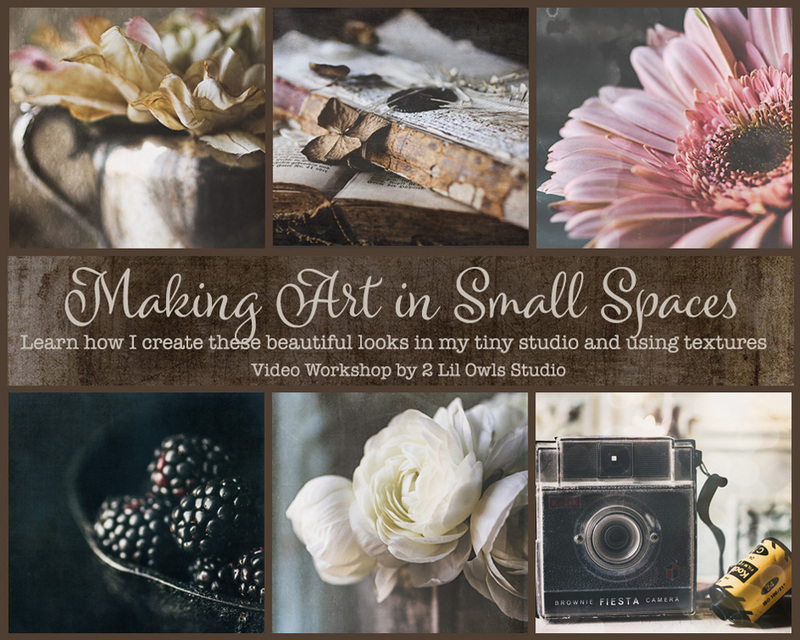 Exclusive New Video Course: This 14 part video course teaches you Denise’s entire process for creating beautiful images. Get an exclusive look inside her private studio, learn her techniques for lighting, applying texture, advanced texturing tricks, and even follow along as she creates 6 intricate pieces start to finish. These are beautifully rich, all new collections full of perfect tones and subtle texture to enhance your photography and design work. Perfect for adding some fine details to a wide variety of subjects including landscapes, portraits, still life and more. They have a color range designed to really compliment your photography without detracting from it. From fun scratchy textures, lighting effects, and beautifully textured elements – this is the ultimate artistic treasure chest! • Compatible with any program that accepts .JPG layers including Photoshop and Photoshop Elements. 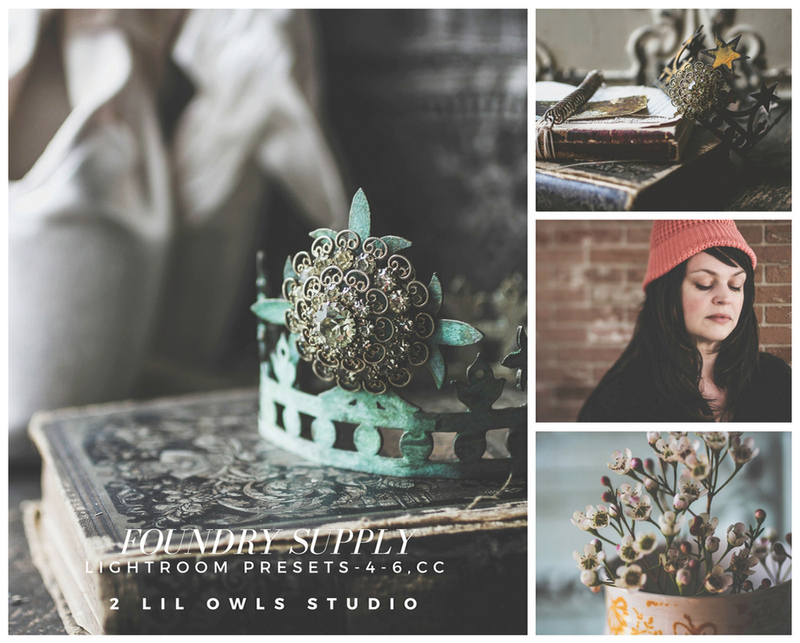 These are beautiful collections for anyone working in Lightroom! 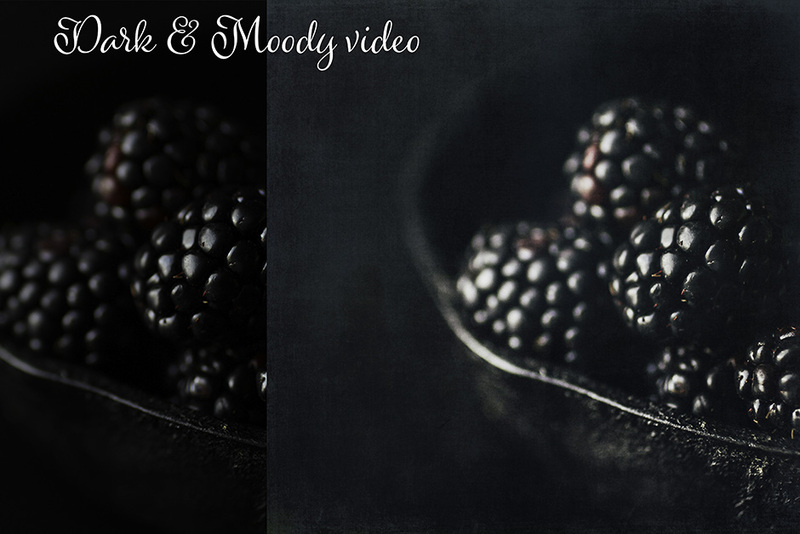 These sets create beautiful rich moody colors for your photographs. These sets are perfect for you if you enjoy doing fine art photography, from portraits to still life. All of these presets are 100% adjustable! Please note: These collections make no adjustments to the exposure or White Balance sliders – allowing you to make these changes as needed on your photo before you apply the preset. • 20 Lightroom Presets in each collection. • 16 original photos with their edited versions included to work with alongside the video workshops! The presets are compatible with Lightroom 4-6 and Creative Cloud, and are perfect with RAW and .JPG files. These Photoshop brush collections are fantastic for adding some little artistic bits to your photography and design work. The Music brushes were created from beautiful handwritten vintage music sheets I have in my collection. The Ink Splots were hand painted and the Soft Grunge were created from wonderful scratchy photos I captured while out at the old car graveyard! These photo masks are super fun elements you can use to create fun edges on your photos. 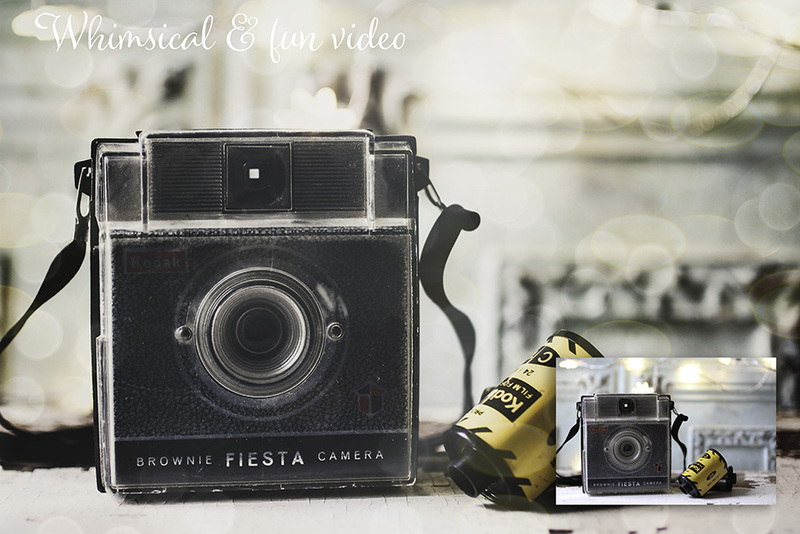 You simply clip your photo to the mask to create an artistic looking, framed photo. • Compatible with any program that accepts .PNG layers including Photoshop and Photoshop Elements. If you’ve ever dreamed of creating beautiful images like Denise, this exclusive new video course will show you! Step inside Denise’s private studio, as she walks you through her entire process. You’ll learn everything from where she sources her materials (cheaper than you might think! ), to how she lights her photographs, her favourite techniques for applying texture and so much more! My Equipment and Studio Space: Learn what Camera equipment Denise uses, as well as where she buys her props, backdrops and more! This is an exclusive insight into her creative workspace. as she talks you through her tried and tested lighting setups. 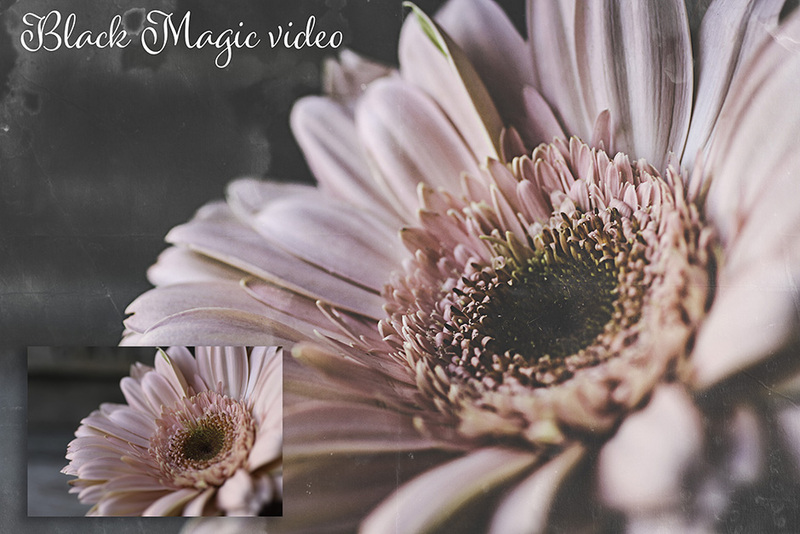 Placing a texture onto your photo: Denise is truly a texture master, and she shows you some of the best ways to add texturing to your photography and design work. Using layer masks: Learn how to utilise layer masks to give you more control over your texture application. Removing texture, but retaining tone: Denise digs into one of her favourite tricks for customising her texture work. Manipulating your texture layer: Learn how to have more control over your textures, for a more custom outcome. Using multiple textures: Combining various textures can lead to some truly stunning results. Denise walks you through exactly how to achieve this. 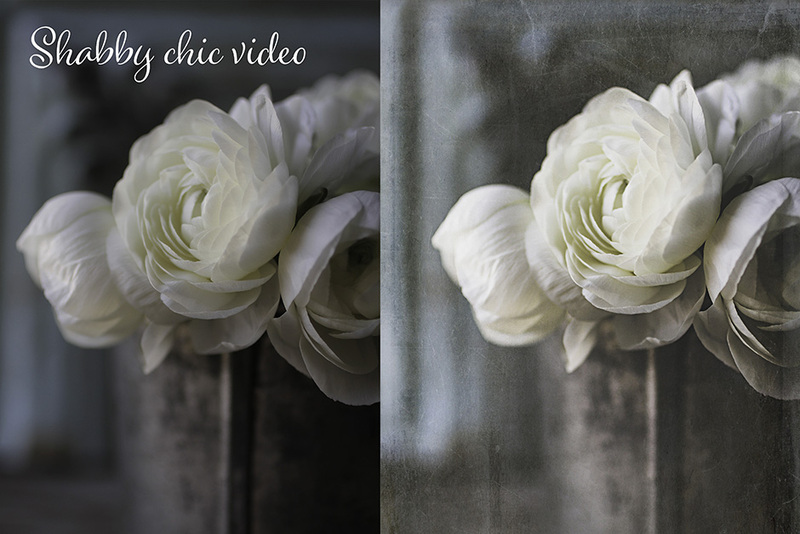 Blend modes and layer opacity: Denise shares some of her favourite blend modes and settings for the most gorgeous outcomes. 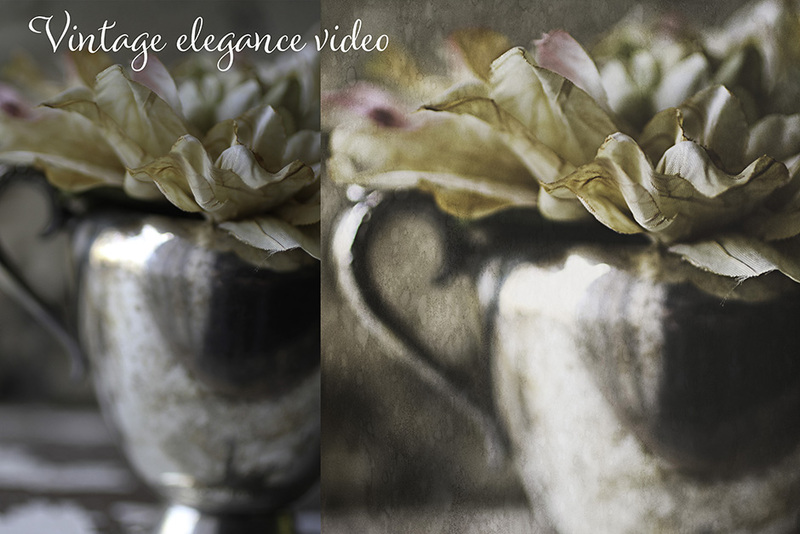 Start to Finish – Vintage Elegance: Follow along as Denise shows you how to create a real outcome, walking you through every step of the process. Start to Finish – Dark & Moody: Follow along as Denise shows you how to create a real outcome, walking you through every step of the process. Start to Finish – Whimsical & Fun: Follow along as Denise shows you how to create a real outcome, walking you through every step of the process. Start to Finish – Beautifully Vintage: Follow along as Denise shows you how to create a real outcome, walking you through every step of the process. Start to Finish – Shabby Chic: Follow along as Denise shows you how to create a real outcome, walking you through every step of the process. Start to Finish – Black Magic: Follow along as Denise shows you how to create a real outcome, walking you through every step of the process. Software compatibility: .JPG and .PNG files will work with most graphic software. 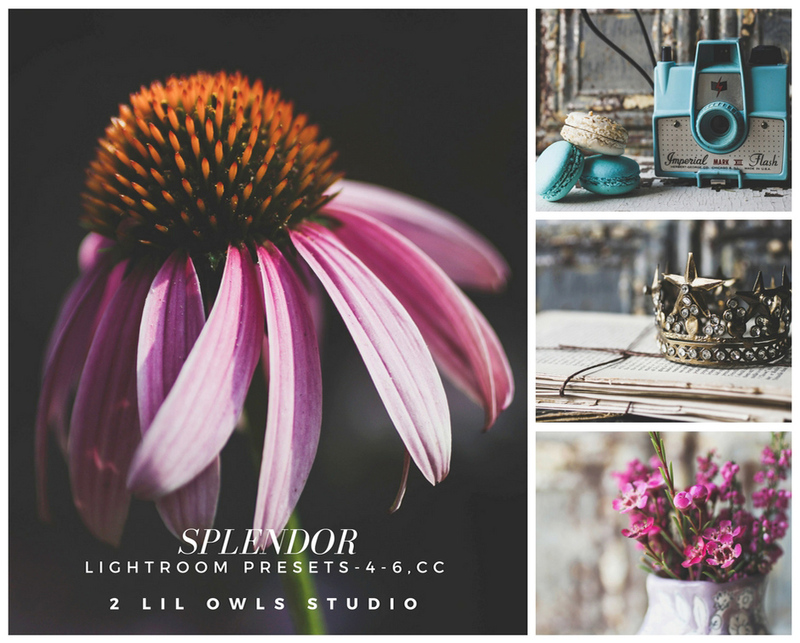 Presets compatible with Adobe Lightroom 4 -6 and newer. Brushes and Photo Masks compatible with Adobe Photoshop CS2 – CC and Adobe Elements 9 and newer. This product is totally new and has never been featured in a past deal. File size is approx 2.67GB unzipped, offered as 4 parts, as well as in one complete download. Thank you for this great product! Would it be possible for you to email me the links for the videos? We’re so happy to hear that you love it Barb and I can certainly help you with this! An email with a dropbox link to your tutorial videos should be swooping its way over to you now, so I hope that you have great fun taking them for a spin :). Just purchased this but I cannot open the downloads. I keep getting the message ‘Cannot open file C;\ …… as archive’ also every time I try to download again the number of remaining downloads keeps reducing. Thanks so much for reaching out to us- I can certainly help you with this! I can see that you have also emailed us so I have popped you over a reply which should be able to help you get working with your new Texture and Photography kit without further delay :). Can I get the Dropbox link for the videos too? Thanks for your comment and I would be happy to provide you with these! I have just popped you over an email with your Dropbox links attached so I hope that you have great fun taking them all for a spin :). Thank you so much for reaching out to us and we hope that you have great fun taking your new Ultimate Texture and Photography kit for a spin! I have just popped you over an email with a link to you tutorial videos so that you can access these offline as well. I hope this helps and happy designing! Even though I purchased this W-A-Y bak in 2017, I’ve decided I would like to download the videos rather than be connected to watch. I’ve seen that you’ve provided a DropBox link for others; would you be so kind as to do the same for me? Thanks for reaching out to us and we can definitely provide you with a Dropbox link so that you can download these to watch offline :). I have just popped you over an email with your links so I hope that this helps! The amount of textures and quality make this a fantastic collection. 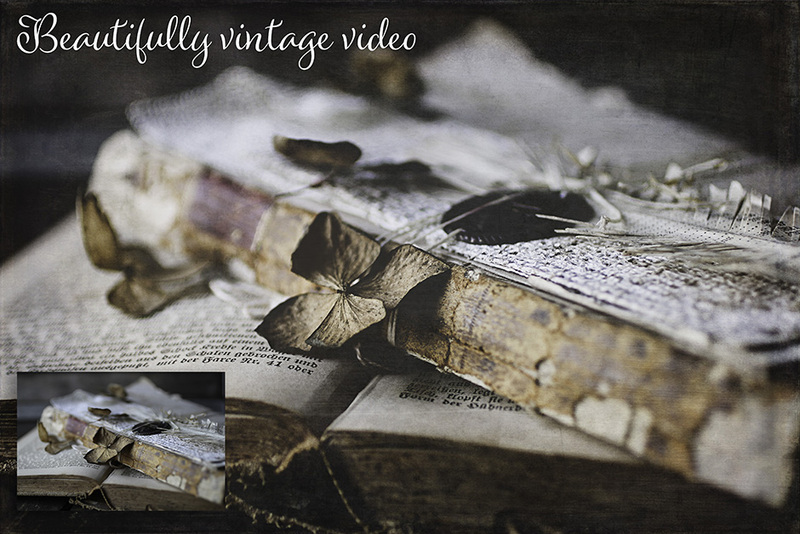 The videos are very basic and excellent for someone just starting to work with textures. Thanks for the lovely comment on this one and we are so pleased you are enjoying the videos with this kit! Please feel free to share anything you create as we would love to see what you are working on! I love this Class it was great easy to follow so much information and so many usable items the video’s are top notch. Some of my favorite go to texture. Thanks for this great package!!! Oh that’s great news thanks so much for the awesome feedback! Missed out on the intro offer as that thing called Real Life pulled me away from my inbox for days… but I’ve always had my eye on this (because: Denise’s Textures. ‘Nuff said 🙂 ), and I finally grabbed it! YAY! Would it be possible to please send me the downloadable videos as well via email? Thanks so much, my DC Superheroes! I would absolutly love to get all your products, but they are very hard to download. The last one I bought has been impossible to download. What should I do? I have already tried to download them individually, but without success. Thanks for the comment on this one and I can see that you emailed us as well on Monday July 24 about this- did you receive my email about this? I have sent you another email to get a bit more information off you and to get you working with your items! Thanks for the comment and oh no, I am so sorry to hear you are having problems accessing your videos- please always reach out with any problems you have though as we are here to help! I have sent you an email to get a little bit more info from you but rest assured, we shall get you working with this! Is it possible to purchase the video course without the digital products? I have more products already (from all your wonderfull offers!) than I know what to do with but would really love the course, just curious! Aw thank you Jennifer- you are most welcome and I will pass your kind thanks onto SJ as well :). We are always here to help so always pop us over an email if you need us! unfortunately i am not able to download the videos from the private site for comfortable watching, what should i do? Oh thank you so much for leaving such an awesome comment! You can definitely have the links to the videos too- i’ve just popped them over to you via email now. I’v bought the bundle when it was at $19 . I love 2 lil Owls textures, They are so amazing and I’m grateful fo your offer !! THANK You a lot. (And in fact I am a little disturbed by the fact I got it at a so low price). Thanks so much for the amazing comment and that is great to hear you managed to get the kit at the intro price :). It is our pleasure to offer these items to you and we are so happy you love working with them! I hate to be the loser who points out that I’ve grown accustomed to your excellent package gallery documents, and miss having them with this package. To add imaginary offense to my delusion of misfortune, Denise didn’t include previews in each collection, either. It’s likely a conspiracy, or worse, the result of an art heist. No worries, I simply dragged your most excellent preview images from the product page to my desktop, renamed and added them to the corresponding folders of textures. Yay me AND you. Thanks so much for your comment and I am so sorry for any disappointment caused by this! Thank you for your kind wishes over the weekend Ronald, we hope you had a great one too. I am so sorry for the delay, as Design Cuts are based in the UK we had finished up for the day! Is there a galaxy of stars button? Well, I guess I missed the special price not once, but twice. 🙁 I tried a few times earlier today and the product page said $19, but it was always $39 in the cart. Oh well; my loss. Your things are always amazing! Thanks for the comment and I am so sorry that you missed out on the intro price- it was available for $19USD until 4pm, London time on Thursday 18 May so if you were trying after this point, this is why it would show as $39USD for you. However you can still get this at a discount if you use our ‘Build a Bundle’ feature in the Marketplace and if you buy this and 4 or more items, you will get 50% off your entire purchase! Oh no! I’m so sorry that the link I sent you didn’t work! I wanted to purchase this at $19 and add it to my cart along with 4 other products so that I can receive a 50% discount. Could you please help me out? You guys are awesome! Thanks for reaching out about this. The intro price on the pack actually expired a few hours before you commented so unfortunately it is now at its RRP of $39USD. However if you are purchasing 4 other marketplace items as well, you will get 50% off the total price :). Thanks so much for your comment and I am really sorry that you missed the intro offer on this one! Thanks so much for taking the time to come back to me and i’m really sorry that you were seeing a blank PDF. I’m kind of happy your accident took place because I missed your email blast about this offer so when the apology email came out, I perked up. I snagged your terrific deal and am already going through the videos. Love! I’m a photog and this is perfect for me! I really enjoy listening to Denise – she’s so relaxed and has a touch of a southern accent. 🙂 Makes me smile. Thanks for your wonderful product packages and keep them coming! Aww that’s awesome, i’m so glad that the second email reached you in good time! Thank-you Denise of 2 Lil Owls for this magical kit, this will be my vacation treat: a computer, your tutorials, a tiny studio with a view, making beautiful things :). Also thanks to Tom & the rest of the DesignCuts team in extending the availability of this amazing deal, professional as always! Thank you so much, that’s fantastic news! Upon purchase, is it possible to download and save the tutorial video for future reference? Thanks-a-bundle!! The extended hours helped put a smile back on me. 😀 This is definitely a keeper for someone who is heavy on vectors most of the time. Another excellent bundle indeed!! Full 5-star on this one. Thanks for the awesome comment on this one and you are totally welcome! Although this is similar in size to our bundles, this one is a marketplace product so rest assured if anyone does miss out on the intro price, the pack will still be available as there is no expiry on the pack! We are so sorry to hear that you’re having trouble with this! I’ve just popped you over an email now to help! I want to purchase this fantastic bundle for $19 before it closes but when I added it to my cart the bill is showing $39 plus $7.02. Why is this. Thanks for the comment and our sincere apologies for the pricing on this one! We had a technical glitch with the intro price on this one last night but we rectified this just after your comment. However I can see that you have managed to purchase the pack at the proper intro price of $19 after we reverted it :). The additional $7.02 you were seeing was actually a VAT charge on the $39. We are legally required to charge VAT to our EU based customers so this will be added at check in to those customers within the EU who do not have a valid VAT number. On the email I received said I had until 3pm today to purchase at $19 but when I try check out it says $39? My apologies again for this mixup and please do let me know if you have any issues! Hi – Tried to buy at the launch special price at 5:34 AM London time and the price was $39. I thought it was supposed to remain at $19 until 3:00PM? Thanks for the comment and I am so sorry for the price confusion- the timing was a technical error with our system and we were unfortunately out of the office when it kicked in! However we have fixed this now and you can still get the $19 until midnight tonight, Wed 17 May to help everyone in various timezones! hi, you have the price wrong. it’s supposed to be $15. Please email me when you fix it. Thanks for the comment and for reaching out about the price! Rest assured this has been fixed now but just to let you know (i think there may have been a typo in your comment! )but the intro price on this is $19USD, not $15! I have popped you an email as well about this but my sincere apologies again! Why has the price increased to $39 prior to 3 pm GMT on May 17? It is 10:49 pm NY time on May 16 and I am trying to purchase at the $19 price, but it is showing as $39. I only received the email today. Thanks for the comment and our sincere apologies for the timing error on this one! Our system decided to have a little glitch on us but rest assured we have corrected the pricing now and the pack is back to $19 and will be until midnight tonight, Wed 17 May, UK time! I hope this helps, and please don’t hesitate to contact me should you have any other questions. 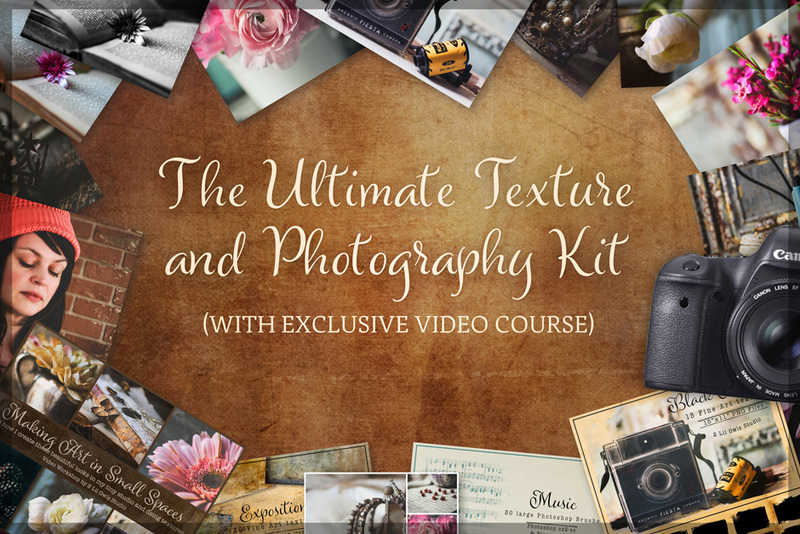 Received email for Ultimate Texture and Photography kit with 24 hour special price at 19 dollars…expires tomorrow. I don’t see the special price (and I am in the time frame for special). I try putting in my cart and it only reflects the 39 dollar price? It is 10:30pm here on 5/16 and I used link for special pricing. Can you help me with this? Thanks for the comment and we are so, so sorry about the error here with pricing. Our system had a small glitch with the timing clock last night and the intro price accidentally reverted to full price. Once we got in this morning and seen this, we fixed it back to the $19 intro and have extended the offer to midnight tonight to allow for the time lapse when we were catching some z’s! Our sincere apologies about this but thank you for reaching out to let us know! Cannot open part 3. Says WinZip file is empty. Have downloaded a number of times. Also the email says $19 until May 17th and this is May 16th. Went ahead and paid the $39. Did I miss something ? We unfortunately did experience an issues with the intro offer timer, so my sincerest apologies that this affected you. I’ve just popped you over an email to get some more information from you so that I can help with this as well as your empty file. Such a great bundle… endless idea. Love Denise’s stuff Thanks once again DC for this awesome deal. Aww we are so glad that you like it! I tried to buy at the launch special & im charged full price! Thanks for the comment on this one and I am so sorry for the confusion here- we had a tech issue last night which we have now rectified! If you check the pack, the price is back to the intro offer of $19 and will be at this price until midnight tonight, Wednesday 17 May, UK time. Our apologies again for this and rest assured anyone who was charged $39 in error, will be refunded! Cart not showing the $19 price, on the $39 price as indicated in the email. Thanks for the comment about this! We are so sorry about this pricing mishap and rest assured we have fixed it as soon as we got in this morning so you can now grab the pack for $19USD until midnight tonight, Wed 17 May, UK time. Our apologies again for the mishap and we really appreciate you reaching out to let us know about the error! To celebrate the launch of this new product, you can get it for just $19 for the first 24 hours only! After this, the price will revert to $39, at 3 pm London time on Wednesday, May 17th. Tried to purchase however checkout price showed as $39 and not$19.The London time was 1:32 AM Wednesday, May 17 when I made the attempt. What do I need to do to get the $19 price? Thanks for the comment and for flagging this with us! We had a technical problem with the price last night but rest assured this has been fixed now and the $19USD intro price has been extended until midnight tonight, UK time to allow for the different timezones to grab the offer! Interested in buying but price jumped up before deadline. Glitch? Thanks for the comment and yep, an untimely glitch! We have fixed this now though and the price is back to $19- thank you for reaching out and we really appreciate your patience whilst we got this sorted out :). Rest assured you didn’t miss out on this one- we unfortunately had a technical glitch on our website in the early hours of the morning, London time but we have fixed this as soon as we got into the office this morning so the price is back to the intro and I have also popped you an email about it! I am so sorry about this and thanks again for reaching out! I would like to buy this bundle but I don’t see the special price of $19. Do I need some kind of code or am I doing something wrong? I don’t want to miss this great bundle!!! Thanks for commenting about this and I know that SJ has popped you an email this morning explaining what had happened! We are so sorry for the glitch on our side but thank you for reaching out to let us know! I have bought a lot of deals from you all and been very happy. However, I just got the email for the Ultimate Textures at 10:58 A.M. (EST) may 16. It is now 8 pm May 16and the $19 price is gone. That wasn’t even 24 hours!! Whats up with that??? Thanks for reaching out and our sincerest apologies about this- there was a technical glitch last night with the pricing but rest assured we fixed this as soon as we realised what had happened when we got into the office this morning! I have sent you an email as well about this but you can still avail of the intro discount until midnight tonight, Wednesday 17 May, UK time! So I got sent this my time 3 am – its now 12 pm ie 7 hours later. I had some issues with my Paypal account so couldnt purchase this earlier. As far as Im concerned Im still within the 24 hr window, and would like to purchase this at the $19 price. Can someone assist? Thanks for the comment on this one and our sincere apologies for the mixup here- there was a glitch with our timer clock so the price reverted to the actual price at midnight, DC time! I know you emailed us as well so I have already responded to your email but the $19USD price is back now until midnight tonight and thank you so much for flagging this with us! Love Denise! I didn’t even look to see what was in the bundle…it’s 2LO’s so it has to be awesome! Thanks! Absolutely gorgeous collection of resources but then I expect nothing less from 2LO. Textures from 2 Lil Owls are an Insta-Buy for me. What a lovely bonus that the brushes will work for almost any flavor of PS. Thank you! Aww that’s awesome news thanks so much! So many great uses for these! Another great bundle, thank you guys!!!! Are the textures in this bundle different from the other 2LO textures you have offered?